The AutumnFest Ale from Pennsylvania-based Weyerbacher pours a deep tawny amber body with a slightly yellowed light tan head. The creamy medium-sized head has solid retention and produces thin lace on the glass. The nose has sweet caramel malts with a slightly spicy edge. A moderate woodiness plays off the vaguest hint of chocolate. Hops lend a dryness, but are light on the bittering. This ale's carbonation is mild and the beer almost seems to teeter on wateriness because the beer doesn't exude body. The flavor is very earthy with a dank woodiness that gives the beer an almost bock-like quality, two seasons late. Light biscuity malts have a toffee sweetness. Chocolate notes develop late and fade into the aftertaste. After the mild sweetness of the beer, the mild cocoa adds a bit of depth. The Samuel Adams Oktoberfest from the Boston Beer Company pours a solid amber body with a slight orange glow. A medium-sized yellowed tan head of creamy foam sits on top and slowly fades with moderate retention. As the head disappears it leaves light wispy lacing along the glass. The nose is fairly light with some dry earthy tones and a modest sweetness. A very, very slight astringency lingers on the aroma. The malts have a modest caramel component matched with a pronounced toasted breadiness. The beer has a very light hoppiness that is mostly dry, rather than bitter or overly aromatic. A slight spiciness appears late as well. The finish is dry and fairly flat on the flavor. A minor sweetness lasts on the aftertaste. The Oktober Fest-Märzen pours a full-bodied straw with a medium-large creamy off-white head. The foam retention is moderate and the lacing is a light and delicate. The nose is sweet with honey notes over robust biscuity malts. Light caramel hints add a slightly darker sweetness, which compliments a slight cellary must. The mouthfeel is rich with satiny carbonation that is refreshing and lends a lasting crispness to the beer. A dry body is produced by moderately bitter hops with the slightest dusting of dandelion bitterness, which accents the pervasive sweet malts. A mild caramel tone to the malts is pleasing, but the distinct honey sweetness is center stage. The malts are bold and biscuity, giving the beer a substantial feeling. A very dry finish beckons another sip of this outstanding Oktoberfest beer. Hacker and Pschorr were separate breweries, with an intertwined history dating back to 1417, until the early 1970s. By 1975 the breweries were merged and the labeling and products were fully integrated. This storied brewery produces a range of traditional Bavarian brews, not the least of which is their classic Oktoberfest märzen. The beer pours a tawny, brownish, amber body with some light highlights. The head is a medium sized tanned white foam of fine carbonation. The retention is fairly light and the lacing is modest. There's a distinct honey sweetness on the nose, mildly reminiscent of orange blossom honey. The light toasted malts have an earthy, lagered aroma. The malts' earthy notes are pronounced up front with a slight woodiness and a classic lager aire. The mildly bitter hops are light overall. The malt body is not substantial, while the honey essence is significant and persistent. Although, the sweetness is never overblown. The beer is drinkable and light bodied with a lasting sweetness and mild hop dusting. Sierra Nevada's Tumbler, a self-described Autumn Brown Ale, pours a deep mahogany body with a thick, creamy light tan head. A craterous surface appears as the long-lasting head slowly fades. The lacing is thin, yet elegant. The nose is dry with mild chocolate notes. Roasted malt aroma is pleasing with hints of aromatic hops. The nose also has a slightly earthy edge with a mildly vegetal character. Chocolate notes are pronounced on the foretaste with lightly roasted malts. A very slight hint of smoke develops, but fades gently into the palate, leaving the beer miles from a Porter with minimal coffee-like influence. Sweet molasses and caramel temper the darker tones of the beer. While full-bodied and substantial, a light, but crisp, carbonation brings a hint of refreshment, while allowing the strength of beer to stand out. The finish is lingering with dryness and a mildly bitter aftertaste. Mercury Brewing's Ipswich Harvest Ale pours a very deep, tawny chestnut brown body. The Large head is light tan and very dense. The foam is creamy with a frothy consistency. Retention and lacing on the beer are both solid. The nose is very hoppy with citrus and resinous pine notes. The sticky hop aroma gives way to a significant malt character with molasses and brown sugar notes. A minor hint of coffee lingers at the edges. A moderate smokiness on the front almost give the impression of a Black IPA, when paired with the considerable hop profile. The beer is highly hoppy with dry pine that lends heaps of bitterness to the beer. Certainly hoppier than most amber ales, this is another solid entry to the Ipswich line. Lingering hops on the finish further contribute to the beer's bold character. The Oktoberfest entry from Brooklyn Brewery pours a mildly-hazy deep amber, slightly tawny, with a gold glow. The head is medium sized in a slightly yellowed light tan. The retention is moderate and the lacing is fairly light. Lagery and slightly bready, the nose is full of toasted malts with a caramel sweetness. There's a very mild underlying hop profile. The beer is very malt forward with a strong caramel sweetness. However, the sweets aren't overwhelming. The malts have a moderate tea-like profile. The carbonation produces a cascading mouthfeel, despite the beer's dry body. A slight cellary must amplifies the beers lager qualities. The finish is rewarding with lingering malts. The dryness on the finish leaves the drinker wanting another sip. Hex: 'Ourtoberfest' is an interesting and unique take on a traditional Oktoberfest Märzen. Like Magic Hat is known for, they've put their own spin on this one. The beer pours a slightly hazy amber body with a golden glow. The head is medium-large and is quite yellowed. The foam is frothy and sticky with excellent retention. The lacing is dispersed, but chunky. The nose is musty and lagery with a prominent honey sweetness. The hop bitterness is very subtle. Definitely a modern take. The most noticeable departure is the addition of spicy rye malts. The lagery edge and crispness are characteristic. The beer has a defined honey sweetness with a balance of bitter dandelion-like hops. The carbonation is crisp and velvety giving this beer a fresh edge. Lingering sweetness and tea-like malt base make up the finish. I found this beer surprisingly good. I've long heard the praises of Magic Hat, but I've met them with very mixed results. Some of the beers I've had in the past just weren't doing it for me. After this experience I'll have to reconsider some of them soon. The Post Road Pumpkin Ale from Brooklyn Brewery pours a clear amber body with a medium-orange tint. The head is large, fluffy, and aerated, colored in off-white. The nose is very dusty and dry, reminds me of running a canister vacuum cleaner. It's highly spicy with light cinnamon, nutmeg and plenty of allspice. There's moderate underlying pumpkin. While the spices are on, this isn't a nose of pumpkin pie. The beer is highly, highly spicy. Allspice dominates almost completely. Cinnamon is detectable as are notes of nutmeg. Light pumpkin blends nicely with the malted barley base, but it is absolutely secondary. Again, for pumpkin beer lovers seeking liquid pumpkin pie, this is not the right choice. While it's a pumpkin ale, I'd say it falls more in line with spice beers, if I've ever had one. The finish is dry and dusty and lingering. Geary's Autumn Ale pours a very deep brown, but features a shimmering clarity and an auburn glow. The medium-to-large foam head is tan and creamy in appearance, which manages moderate retention, but leaves almost no lacing on the glass. Toffee and caramel aromas emanate from the toasted depth of the beer. A distinct fresh-like malt sweetness underlies that seems almost on the sugary side. The beer has an initial roasted character with smokey richness over a crisp body. Almost cloying sweetness comes in on the mid-palate that's reminiscent of unfermented sweet malt extract. A minor reprieve is provided by a moderately bitter hop profile on the finish and continued crisp carbonation. The aftertaste give a mishmash of smoke and extract-like sweetness. The seasonal Harvest Special Ale from Southern Tier is billed as an Extra Special Bitter, a classic English style. The beer pours a tawny copper body with a slightly yellowed, medium-sized head. The despite the frothy consistency, the retention and lacing on are both light. It has a bitter, almost piney hop nose. The maltiness is moderate with toasted caramel and slight cocoa hints. The nose hinted it, but the taste confirms, the hop profile seems a bit off from that of a traditional ESB. Hops are pungent and piney, giving this beer the feel of a moderate IPA or a hoppy amber ale. The malts aren't pronounced, compared to the hops. A slight toasty biscuit profile is present, but not distinguishing. An ESB true to the style should have a more developed malt character that strikes a balance with the hops. While bittering is important and central to the style, a more reserved, less pungent, hop profile would've given this beer a more spot-on feel. The Octoberfest märzen from Harpoon Brewery pours a dark tawny copper body with a light orange glow. The medium-sized yellowed tan head sports modest retention and is very light on lacing overall. The nose is very malty with sweet caramel notes and a lightly toasted bread component. A slight spicy hop character is also clear on the aroma. The brew is malt-forward with a big malt profile. Hops in this märzen are very light and provide a slight dry bitterness more than anything. The breadiness is very mild and the malts seem more sugary than full-bodied. Mild alcohol near the end seems a bit out of place for the style and strength of the beer. Additional, but moderate spiciness is present on the finish, but it doesn't out do the grainy sweetness of the beer. Originally founded in 1867, Leinenkugel, based in Wisconsin, was purchased in 1988 by Miller Brewing Company (now itself a subsidiary of brewing behemoth SABMiller). Much of its beer is still produced in Chippewa Falls, WI. Their Oktoberfest beer pours a light amber body with a moderate gold glow. The medium-sized light tan head has a creamy appearance and solid retention. Lacing on the glass comes in large swathes. The nose is sweet and grainy with light caramel hints. A slight sour grain funk seems a bit out of place for the style, but a moderate mustiness gives the lager a somewhat traditional feel. Smooth and plush carbonation gives the beer a feeling of big body, but not of substance. A light hopping is dry, but the dusting seems overshadowed. The beer's malts are prominent, but not bold or defining, although a mild spiciness adds a hint of depth to the palate. The overall flavor of the beer seems to evaporate quickly leaving a dry, slightly dissatisfying aftertaste. During my quest to collect all of the Narragansett beer varieties I inevitably had some prior season beers in my refrigerator and as a result I decided to do a head-to-head comparison of the 2010 and 2011 Fest Lagers. While an interesting experiment, normal gravity lagers have 'Best by' dates for a reason. While some new flavors developed, some of the best characteristics of a fresh Fest Lager were lost. The 2010 Fest poured a deep muted amber with a mild diffuse glow, quite hazed after one year, while the fresh 2011 pours a shining amber with distinctive glowing orange and ruby hints. Both beers produced a large, craterous, light tan head, although the 2010 was slightly darker and speckled, both had solid retention. Lacing on the 2011 Fest was moderate, while the 2010 was fairly light. A year in the can let the hop character of the older Fest dissipate a bit, leaving a malt-forward nose with a defined sweetness of broken down sugars. The 2011's nose was quite lagery with a cellar must and a mild vegetable aroma. Caramel malt sweetness was present with a light dusting of hops. The 2010 was very sweet up front and lightly sugary, compared with a mild and relaxed caramel sweetness and lightly toasted biscuity malts on the 2011. What I took for a moderate earthiness on the fresh Fest seems to have developed into a mild nuttiness with accents of candied Winter fruits after a year's sit. The nuance of flavor provided by lightly bitter hops was all but gone in the 2010, while the fresh can featured mild, but overall tight hops that produced a dash of bitterness. Carbonation was modest overall on both, but not watery. Mild sweetness lingered on the finish of the 2011 Fest with a clear emphasis on the malts and a slight hint of vegetation. The sweetness was highly emphasized in the 2010 by comparison. Final Verdict: Age beer that is intended to be aged. This head-to-head was an interesting experiment and not at all unpleasant, however, hands-down, the 2011 was more enjoyable than the 2010. This is an absolute testament to the importance of freshness dating. While the date isn't a drop-dead date by any stretch, it is an important reference when it comes to cellaring your beer. Over the next days, weeks, (and more?) Musings will see a series of posts celebrating the most celebrated beer season. Oktoberfest goes into full swing this Saturday (September 17) in Munich and accordingly beer stores everywhere are stocking dozens upon dozens of Fall seasonal beers ranging from small craft producers to macros who just can't seem to stay away. The traditional Oktoberfest beer is a Märzen, originally brewed in March (or thereabout) and held in cold storage throughout the Summer. Before the advent of refrigeration technology Summer brewing was difficult and potentially unsafe (due to bacterial infection). Thus, Summer (and later Spring months) were not available for brewing and the early Spring stock was held through the summer (in cellars or caves) for drinking in Fall during the annual harvest. While Oktoberfest/Märzen beers remain extremely popular, many breweries, particularly American craft producers opt for different styles of ale or lager for their Fall seasonal fare. Especially popular in America is the Pumpkin Beer. Pumpkin ales are made with the addition of real pumpkin, puree, or flavoring. Typically, these beers also introduce spices commonly used in making pumpkin pie. Keep an eye out during this Fall seasonal series for at least two dozen Fall seasonals from American and European producers in a variety of styles. 2XIPA from Southern Tier (unsurprisingly a Double IPA) pours a chill-hazed golden straw with a minor orange glow. The beer's large head is airy with a constant rising carbonation from the center of the glass. The slightly yellowed foam sports fairly solid retention and produces great, complex lacing. The oily hop nose of the beer is strong on the pine, with some definitively earthy notes and a very vague astringency. Surprisingly, from the nose, the beer is not overboard on the hops and comes across quite malt-forward. Perhaps I was getting to this Double IPA a bit late and some of the extra hop kick had faded in the bottle. After a slight hint of vanilla, the resinous pine hops make a come back with a spritz of citrus. The hops fade fairly quickly into dryness and a distinct alcoholic heat, which is not overwhelming, but warming. The carbonation and malts leave a slight gristle on the tongue. This India Pale Ale from Southern Tier pours a light golden umber with a mild haze and a large frothy yellowed head. The head retention is solid and leaves delicate lacing on the glass as the foam slowly recedes. The nose is somewhat plain with a mild dustiness and dry, simple hops. The bitter hops on the foretaste are prominent, but not overly bold. The hops give the beer a very dry mouthfeel, almost dusty, that dominates the palate. Tea-like malts are semi-sweet and medium bodied, buoyed by velvet carbonation. As a reminder, Musings on Beer will be on auto-pilot for a little over a week while I'm traveling. Luckily, I've queued up enough posts to keep the blog busy for almost a month. This time I'm a bit more prepared than when I traveled to the American West and Southwest. Over the next week I will be traveling and experiencing the cultures, cuisine, and drinks (beer especially) of Scotland (oh, I will be sampling Scotch as well) and Munich, Germany. At Oktoberfest in Munich I'll be enjoying Märzens by the maß and subsisting on schnitzel and würst. I hope to report back upon my return with photos, stories, and thoughts on the my experiences and beers. Please enjoy the blog in my absence and continue to check back for daily updates. Following yesterday's Double IPA from Boulder comes a blueberry infused wheat beer. Kinda Blue pours a moderate purply tinted pale amber body with a reddish glow. The large fluffy head is light tan, but also features minor red tint. The retention is solid and the lacing is light. The nose is dry and dusty with a mild astringency and very feint blueberry aromas. A slight sweetness lingers, but the nose does not seem candied or cloying. What this beer does right, off the bat, is that it seems to start with a competent wheat beer. Mildly spicy wheat is apparent in this mixed-malt brew. Satiny carbonation mixed with a gristly malt body give the beer some additional texture. The blueberry flavor is semi-sweet and almost slightly tart. This "with blueberries added" beer does not seem candied, cloying or artificial. The fruit flavor is more of an accent, not overbearing. The aftertaste has a moderate sweetness and seems fresh, which contrasts some of the dry elements and the cracked malt texture. On Saturday September 10, 2011 I volunteered for the Belgian Beer Fest hosted in Boston, MA by Beer Advocate and Allagash brewing company. This time, as compared to my time at the ACBF in June, I was able to take more photos, some of which you will see below, but I was, unfortunately, unable to take notes on the beers I tasted. Luckily, I was able to sample and enjoy a number of beers, a (very select few) I will mention as stand outs below. The Cyclorama as the tables and curtains were being set up. If you've never been, the Cyclorama is a great space with exposed brick walls and a gigantic dome ceiling. The echo was loud during the set up and the magnification of the general hum of the beer drinking crowd was impressive. During the set up period we delivered cases and kegs of beer to the tables for the breweries and distributors who would be in attendance. Boston Beer Company featured two beers from their barrel aged series. On the right side of the hall a number of breweries set up their tables with decorations and tap boxes. Smuttynose was one of several New England-based breweries in attendance. On the left side of the hall Pretty Things worked on getting pretty with their signature felt banner and flower decorations. Fest attendees enjoying samples of delicious Belgian and Belgian-inspired beers. Chimay USA, representing one of my favorite brewers, was in attendance, featuring a Seth Rogan look alike pouring excellent beer and dispensing beer knowledge. 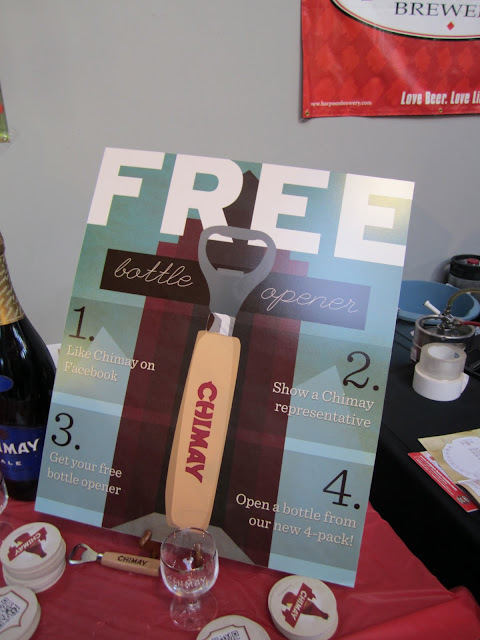 As part of what looks like a new art direction for their advertising campaign, Chimay was giving away wooden-handled bottle openers. I greatly enjoyed the fest and had a lot of fun working, but, unfortunately, I was unable to take notes on my favorite beers. I tried a many, but was only able to keep track of a few. Luckily, the ones I remembered were stand outs. 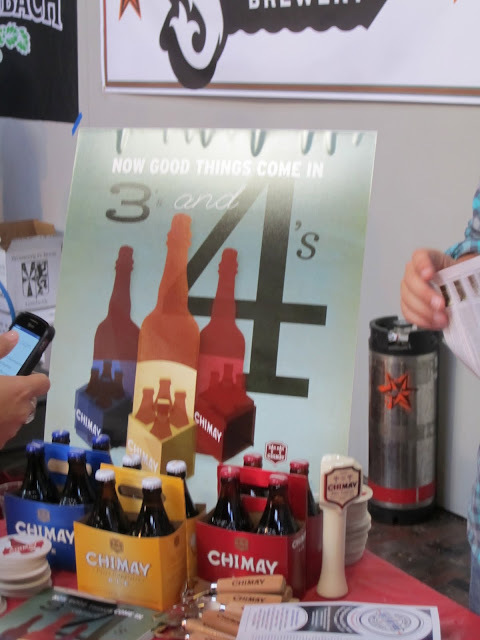 While there may have been other in attendance, I noticed two, very interesting, low ABV beers. First was the Beerstand Berlinerweiss from Haverhill Brewery. The beer is a Berliner Weissbier that weighs in at between 2.7-3% ABV. Through a sour-mashing technique the beer has a distinctive tartness, but also features prominent wheat malt character and a mild spiciness. A great Summer-drinking beer that's light on alcohol. Also featured at the Fest was Magnifico from Pretty Things Beer & Ale Project. Magnifico is a Summer seasonal, draft-only, Belgian-style Pale Ale. The beer came in at about 3.4% ABV, but has all the trappings of a real beer. Delicious and highly drinkable the beer has a light bodied maltiness and a dusting of hops on the finish. Magnifico is a total rarity that may be a one-off run. I'd recommend checking it out, but it might not even be possible. Lindemans is a great Belgian Lambic brewery that has wide availability in the USA. While many of their Lambic fruit beers are easily found, their distributor, Merchant du Vin, brought Cuvée René and Faro with them to the Fest. Faro is a blended Lambic style, formerly exclusive to Brussels and still not commonly found outside of Belgium. The beer's blend also includes the addition of candi sugar and is often spiced slightly with pepper and orange peel. The addition of the sugar syrup takes away slightly from the acidity of other Lambics and makes the beer highly drinkable, although sweet. Cuvée René is a Lambic Gueuze from Lindemans and it is fantastic. It's everything that a Gueuze should be. The beer is delicious with sweet notes and a defined fruity tartness. Grape-like components are spectacular and the carbonation dances on the tongue. A solid, solid, beer that is available in the USA, but is certainly more rare than the fruit-flavored fare from Lindemans. 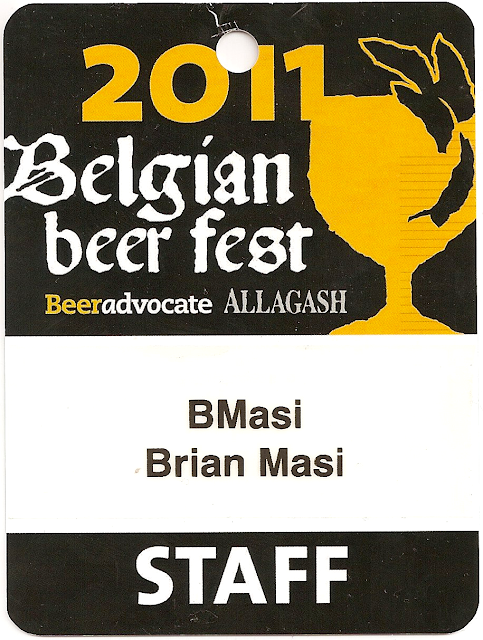 Two other stand outs from the Fest were Cellar Door from Stillwater Artisinal and Mattina Rossa from Allagash. Cellar Door was secretly available at the Fest. No sign was hung and the bottle(s) were kept hidden from plain view. However, requesting a taste gave you a nice pour and a wink. The beer is a spicy saison style oozing with freshness and yeast character. The spicing was elegant, but powerful. Mattina Ross from Allagash is a Wild Ale style beer aged in oak and flavored through two additions of raspberries. Unfortunately, the bottle conditioning of the brew turned out a bit spotty. Some bottles refermented to produce carbonation, while others remained still (at least so far). 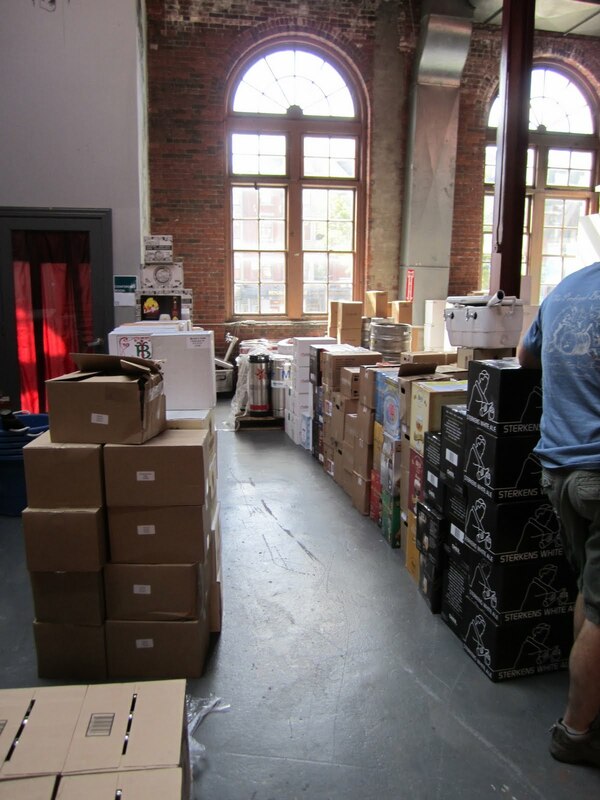 As a result, the quality control issues prevented the beer from being offered for sale to the general market. Luckily, a few cases made it to the Fest. Delicious, tart, fruity, and spicy, this beer is a gem. I can only hope Allagash won't be deterred from trying this beer again, or following up with an even better entry sometime in the future. I had a feeling, but I kept an open mind and tried this unusually flavored beer with some hope. Unfortunately, the Chapeau Banana Lambic from De Troch was just bad. The trappings of a quality Lambic were seemingly missing and the banana flavoring seemed artificial. Slight tartness was nice, but the flavors of a Lambic beer and a banana may just be destined to clash. I wouldn't recommend the beer to most people. Mojo Risin' from Boulder Beer Company pours a moderate orangy amber body with a slight chill haze. The head is large and fluffy with a lightly yellowed hue. The sticky foam manages solid retention and leaves thin clinging lace around the top of the tulip glass. The nose is defined by a pungent resinous pine hop aroma. The beer is clearly strong and slightly boozy on the front. Quite hop forward, slick pine hops exude their essential oils. Light hints of grape fruit are apparent. There are very modest caramel notes in this hop-centric Double IPA. Caught at the end of the beer's prescribed life, the hops hold up quite well and have not succumbed to the big malts that give the beer its strength. The finish has a mild sweetness and a tinge of heat. Koningshoeven is the only certified Trappist brewery in the Netherlands and produces most of its beers under the brand La Trappe. Tilburg's Dutch is the exception and features and eyecatchingly-bizarre label design. The beer's deep brown body and ruby glow give it an appearance of a magnificent mahogany. Despite its depth, the beer is crystal clear. The light tan medium-to-large head is mildly creamy and its moderate retention leaves a ring of lace around the glass. The nose is lightly earthy and slightly nutty for a classic brown ale nose. Caramel and toffee notes add a light sweetness atop minor coffee-like hints. Terrific Belgian-style yeast adds a cellary must edge to the beer and sets Tilburg's dutch far apart from most other typical brown ales. The toasted malts are prominent and provide a mild woodiness and extensive sweet caramel notes. The beer is highly drinkable, but not overly crisp. The carbonation is somewhat tempered and the beer finishes with a lingering dryness. This Rhody IPA from Trinity pours a deeply hazy body that is nearly opaque. The orange-glowing amber has a large head of aerated, but frothy, foam. The retention is tremendous and the head leaves extensive, sticky lacing on the glass. The beer has a dank, sticky hop nose. Pine and citrus notes are pungent and tight. Minor earthy and vanilla notes are also apparent. Off the bat the hop character is surprisingly restrained over a sweet caramel malt body. Hops are prominent, but somewhat mild and quite forgiving. The sweetness has a minor honey flavor to it that leaves a slightly waxy feeling on the palate. The hops are mildly bitter and come across very dry and firmly on the piney side. There's a minor resinous character on the finish with a very fresh malty edge. This Belgian double pours a deep mocha brown with floating specks of yeast from the beer's bottle refermentation. The moderate frothy tan head is also speckled with yeast and has impressive retention for the style and strength of the beer. The nose is strong and semi-alcoholic. Dark fruits are prominent with a slightly musty back end. Minor coffee notes bring up the low end as well. A great example of a traditional Belgian Strong Dark Ale, the beer features broken down malts and a mild candied edge to the beer's distinguished Winter fruits. Figs and dried plums add sweetness tempered slightly by earthy undertones. The beer has a slight Port wine-like character and a dry, cellary essence. The finish is dry with a mild lingering damp woody sweetness. Shiner Bock is a Texas favorite and the pride of Shiner. The beer pours a deep chestnut brown with mild amber highlights. The moderately sized head has a light tan coloration and sports modest retention. The nose is musty with a slight nuttiness. Semi-sweet toasted caramel malts add a hint of sweetness. Overall, the nose is very dry and dusty. The beer has a metallic lager-like foretaste with bubbly carbonation. Noble-type hops provide a mild Pilsner-esque flavor. Toasted malts on top of the basic lager frame add a hint of caramel sweetness and mild biscuity notes. The initially pronounced, but later fading woodiness gives the beer a truer bock feel. The finish is semi-sweet with a lingering dryness. Shiner Bock is a totally competent and enjoyable beer from the Lone Star state. Oude Gueuze is an entry from Hanssens Artisanaal into the singular and classic style of Lambic beers from which it takes its name (Gueuze or Geuze). The beer pours a chill hazed orange body clouded with yeast and dotted with specks of floating sediment. The moderately-sized nearly white head is also speckled with orange flecks of yeast. The retention on the head is modest and the foam leaves a light layer of lace at the top of the glass. The nose has an aroma of sweet sugary grapes and a mild fitting mustiness. The slight cellar funk comes from the spontaneous fermentation that the beer goes through, and the 2+ years in the cellar. Gueuze beers are a mixture of "young" (one year old) and "old" (two to three year old) Lambics that are subsequently cellared for an additional year. The beer is extremely fruity and considerably tart. The tightness of the beer almost pinches the cheeks while you enjoy the beer. Carbonation in this Oude Gueuze is high and has pronounced Champagne-like qualities. Sweet and complex without being sugary or cloying the beer's tart funk and grape-like qualities make the style unlike any other. It's delicious and refreshing and worth checking out. Gueuze beers aren't very common in the United States, and are certainly not a popular style, but are well worth being explored. If you can find any authentic Lambic Gueze I'd recommend it. I'd especially recommend Oude Gueuze from Hanssens, especially for the price. he is most incapable of resisting disease." Sierra Nevada releases a Fresh Hop ale twice a year, one for each harvest of the Northern and Southern hemispheres. The Southern Hemisphere Harvest prominently features New Zealand's Fall hop harvest (during our spring). The result is an impressive beer that pours an orange glowing auburn body with a slight chill haze. The head is massive and frothy with a yellowed-tan coloration. The lasting power of the beer's foam is impressive and its lacing is eye-catching. The nose features heaps of fresh grassy hops and a hint of mildly dusty yeast that helps illustrate the balance between citrus and pine notes. Aromatic hop oils have a huge influence over the flavor of the beer and fresh whole cone hops seem to be bursting with flavor. The hop character accentuates layers of pine, minor grapefruit, and an almost tart bitterness. Minor caramel malt flavors provide a nearly invisible base to the beer. The malts aren't weak by any measure, they're simply upstaged by this hop-forward showing. The finish is at once somewhat dry and refreshing. Lasting hop characteristics round out this 2011 showing. Shmaltz Brewing Company - He'brew - Bittersweet Lenny's R.I.P.A. This rye-malt IPA pours a deep and reflective mahogany with a amber glow. The massive head is smooth and creamy with large craterous bubbles with a moderately soapy film. The retention on the head is great and lacing is light. The strong hoppy nose is at once earthy and smooth. Hints of vanilla and a resinous pine play with the caramel sweetness of the malts and the added body and depth of malted rye. The spicy rye malt up front interacts with the strong hopping and accentuates the slick molasses of the beer. The hops are dominant, but cannot fully suppress the grainy and earthy malts of the beer or the strong alcoholic character. The alcohol component is strong and the beer seems quite boozy. It weighs in at 10%, which is high for a Double IPA, but it is far from subtle. The Summer Ale from Maine-based Shipyard pours a moderately pale straw body. The beer's medium-thin head is bright white in color, but has almost no retention and leaves no lacing on the glass. The nose is slightly sour and gives an overly sweet malty aroma. There's a bit of dryness among the almost candied edge with no noticeable hops of substance. The beer sports a sweet raw maltiness that is thin and disappointingly almost sugary sweet. Despite some redeeming honey-like characteristics, it comes off vaguely cloying. There are no perceptible hops and likewise no true depth of flavor. The malt character is not enough to hold its own without an aromatic counterpart. The carbonation is moderate and semi-refreshing, but it doesn't help make this beer any more enjoyable.